The team that brought you No More Tomorrows have collaborated again to produce another of Mark’s scripts called Surrender. Mark also served as Executive Producer on this project. 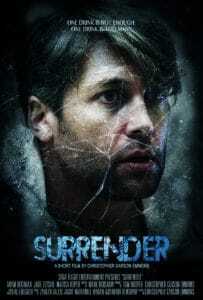 Surrender attempts to immerse the viewer in the nightmarish world of a functioning alcoholic, as his attempts to lead a normal life completely fall apart. It has a alcoholic Alice in Wonderland vibe to it and as such, it may be a surreal and uncomfortable experience for some but it delivers an important message while attempting to tell the story in a unique way. The short film is already making vibes on the internet having been featured on Ain’t It Cool News and has been selected as a daily short pick on Film Shortage. The short is available to view via Vimeo and YouTube and has been added to the Produced & Published page. For more information, check out the official website and Facebook page. This entry was posted in short film and tagged alcohol, short film. Bookmark the permalink.